Lightglass Optics is proud to be the sole distributor of Contrast Optical Design & Engineerings new DNO Series of Optical Mount. Utilizing their patented actuation system, which eliminates the uses of springs altogether, this mount is ideal for high-vibration environments such as aircraft and spacecraft. 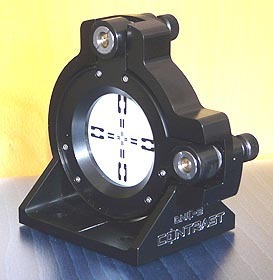 This 2" mount allows tip/tilt actuation with a range of 10 degrees in each axis, with no coupling between the axes. Mounting of your 2" diameter optics couldn't be easier! This mount utilizes a patented Kinematic Bayonet system that allows removal or changeout of your optical elements in just seconds- with no tools needed! Keep multiple Kinematic Bayonet cells on hand and have the ability to change your lens, mirror, filter, beamsplitter or whatever with just a touch of a button and a quarter twist- and then mounting the next element in exactly the same position!